The second session of the first day began with a mandala offering to His Holiness, after which he resumed the oral transmission of The Life of Milarepa beginning at Chapter Seven, which is titled “Meditation”. In Chapter Seven, in response to a question from his disciple Rechungpa, Milarepa describes the hardships that he underwent when he went on a meditation retreat in the mountains for several months. He took a sack of tsampa and dried meat with him, meditated for several months and then his provisions ran out. He was loathe to curtail his meditation practice so he decided to beg meat from local nomads and grain from farmers in the valley. At the nomad encampment he encountered his aunt, his father’s sister, the one who with his uncle, his father’s brother, had cheated him and his family out of their inheritance after the death of his father. When she recognised him she was incensed; she cursed and abused him, and beat him almost to death with a tent pole. Milarepa responded with a song in which he reminded her of what she and her husband did, and the terrible consequences for his mother “ killed by the sword of poverty” and his sister “wandering to the ends of the earth” . This led to “sadness and bitterness” and “intolerable grief”. However, he acknowledged that it was this experience which turned his mind to the Dharma. After hearing Milarepa’s song, his aunt felt great shame and she and the other nomads gave him food and alms. Milarepa then went to beg from the peasant farmers in the valley, and encountered his uncle, who abused him, threw stones, and then shot arrows at him and summoned the villagers. When some of the young men began throwing stones at him too, Milarepa decided to use black magic, and called on his guardian deities. Terrified, the villagers relented, begged forgiveness and made offerings, all except Milarepa’s uncle. The next section of the chapter recounts a conversation about genuine Dharma practice with Zessay, his former fiancee. There is a question mark hanging over the future of the family house and field. Milarepa had no use for it and offered it to Zessay, but she declined. When his cunning aunt heard of it, she came to visit him, full of apologies and bearing tsampa,dried meat and chang (Tibetan beer). She promised to provide him with food in return for the right to cultivate the field, however she only kept her promise for two months. Then she claimed that people were frightened of Milarepa’s guardian deities and Milarepa agreed to take an oath in order to make her happy. The story moves on to his meditation experiences. He found himself unable to practice tummo , the heat-generating meditation. Finally he had a dream in which Marpa appeared to him and encouraged him to plough his field, and immediately an abundant harvest sprang up. He realised that the dream meant he would be successful if he continued with his meditation practice. He moved to a different area. Once more his aunt appeared, bringing him clothing and provisons, which she offered as the price of the field. She lied, saying that the villagers, afraid of Milarepa’s black magic powers, were threatening to kill her and her husband, and urged Milarepa to go far away. Realising that his Dharma practice meant he had no need of the field or the house, Milarepa gave them to his aunt who was overjoyed. Disturbed by this, Milarepa moved to Horse Tooth White Rock in order to continue his meditation practice, and vowed not to return to an inhabited place. Milarepa resumed his meditation, but the problems persisted until a group of women, who told him Marpa had sent them, instructed him in yogic practices. Thus, finally, he accomplished tummo. Another year of meditation practice passed. He remembered the instruction to meditate rather than sleep, and began meditating night and day, and another three years passed. His desire to reach enlightenment was so great that, even when his food ran out, he refused to break his vow in order to go to the village. He ate nettles instead. 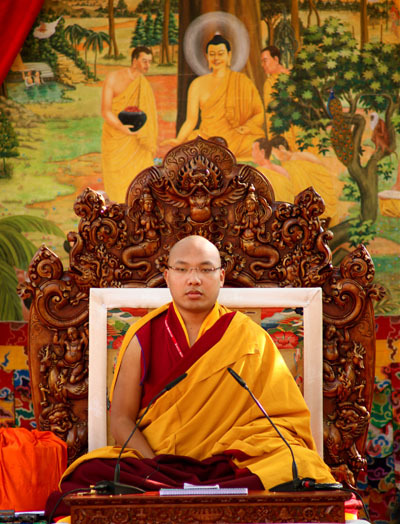 In his commentary on this the first part of Chapter Seven, Gyalwang Karmapa said that the main point in the story is what it means to practise the genuine dharma. It reflects what is said in Shantideva’s Bodhisattva’s Way of Life, that if there is no suffering, there is no incentive to turn the mind to Dharma. Milarepa suffered greatly. His aunt robbed him of all his possessions, he used black magic and killed people, then he deeply regretted what he had done and his mental suffering drove him to renounce samsara and practise the Dharma. He studied with great masters and received the complete instructions on how to become enlightened in one lifetime. Without genuine renunciation of samsara and commitment to working for enlightenment, we will not be able to practice genuine Dharma and abandon worldly dharmas. Milarepa was a renunciate; he became like a wild animal. He lived in a cave, forgot about food and clothing, and concentrated on dharma practice. If monks and nuns dedicate their body, speech and mind to the dharma, keep pure ethical discipline, working for benefactors and sponsors, their lives will be meaningful. This song advises us to practise calm-abiding meditation (samatha) and insight meditation (vipassana) together.In addition we need to rely on the instructions of a teacher. Our afflictions are defeated by samatha but the root has to be excised through vipassana. Then our mind will become stable like Mt Meru, pliable and under our control, so that we can use it in a positive way, and we are not overwhelmed by the afflictions. Insight meditation is the antidote to the root cause of the afflictions, whereas calm abiding shows us the nature of the mind. In Vajrayana, His Holiness explained, we talk of samatha as accumulation stage and vipassana as completion stage. We should try to generate bodhichitta, working diligently at developing it, and also work to overcome any difficulties that we encounter. It is said, he commented, that it is easy to reflect on Dharma when you have plenty to eat. In fact, we just feel sleepy. In our own practice at home, we should think about compassion and love. Sometimes it is hard – an affliction arises – and, when we encounter problems, it is difficult to use the dharma in our lives. However, we must always guard our body speech and mind. This is the practice of Dharma. Otherwise, in the form of a dharma practitioner, we might be practising non-dharma! The great Khadampa masters had a method to keep a check on each day – the count of positive and negative. They used to use black and white pebbles for positive and negative thoughts. At the end of the day they could see which one was more. This was practise with aspiration and seriousness. His Holiness pointed out that in the very place where the Buddha woke up from ignorance we should not go to sleep. Rather we should turn our mind to the Dharma and use this place to work hard and practise. His Holiness then led the assembly in a short five-minute breathing meditation, resting the awareness on the breath.